Last week I booked tickets for this year’s epicurean feast, Diner en Blanc. It will be my third year at the event and so far (touch wood) I’ve made it through each without any major gooping on my outfit and that’s no easy feat for me! For those who haven’t heard about Diner en Blanc, you can read about my past experiences here or here, but basically it is a fancy pop-up picnic in which the location is kept a secret until the very last minute when thousands of participants arrive en-masse by bus, train and even on foot—dressed in white. As well as dressing to the very strict all-white dress code, picnickers also need to provide their own tables, chairs, decorations, food and drink. Everything aside from the food and drink must be white. With my table and chairs already sorted (I got them from Kmart if anyone is looking for cheapies), and with the menu still up for discussion with my dining companions, I decided to start the hunt for something white for the big night. To help those who are doing it tough finding options, here are some of my favourites that are in stores now. 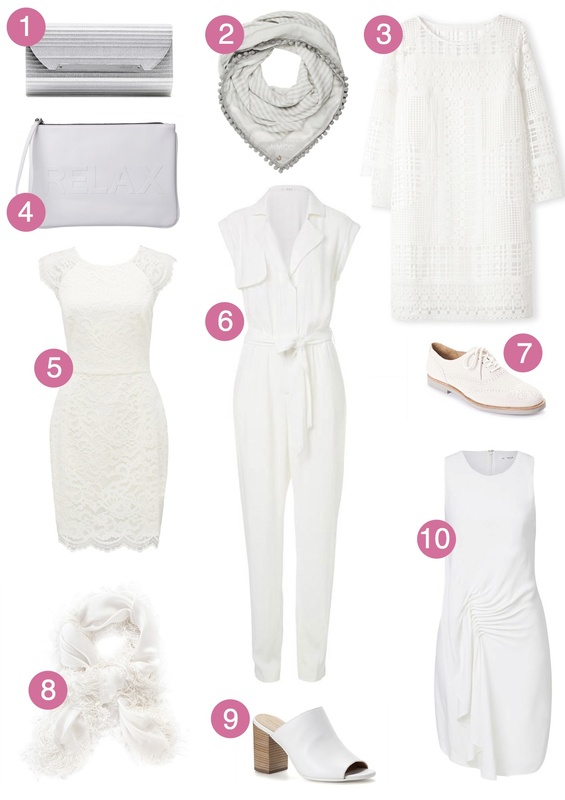 Also, check out my lovely friend/stylist Chasing Cait’s awesome guide to trying whites for spring. 1. Mimco Premiere Clutch, $179 | 2. Mimco Luxurian Scarf, $69.95 | 3. Country Road Broderie Detail Shift Dress, $229.95 | 4. Colette Hayman Relax Clutch, $19.95 | 5. Forever New Nikki Lace Bodycon Dress, $149.95 | 6. Seed Heritage Utility Wrap Jumpsuit, $169.95 | 7. Country Road Hayden Brouge, $149.95 | 8. Country Road Fringed Scarf, $79.95 | 9. Country Road Antonia Mule Heel, $179 | 10. Seed Heritage Drape Evening Dress, $189.95. If you’re keen to join the festivities at this year’s Diner en Blanc, join the waiting list here. Oh hey lady! Thanks for the shoutout.